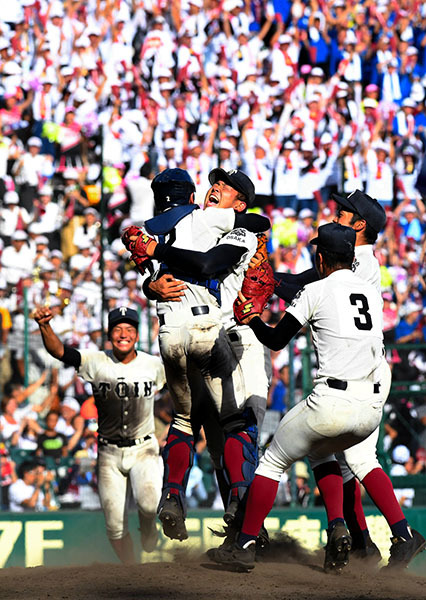 NISHINOMIYA, Hyogo Prefecture, The Asahi Shimbun, Aug. 21 --In becoming the first team ever to win the spring and summer high school baseball championships in the same year twice, Osaka Toin Senior High School made it look easy. The school, representing northern Osaka Prefecture, pounded Kanaashi Nogyo High School of Akita Prefecture 13-2 in the final of the National High School Baseball Championship at Hanshin Koshien Stadium on Aug. 21. Kanaashi Nogyo failed in its own bid to make history, trying to become the first school representing Akita Prefecture to win the summer championship in the 100-year history of the tournament. In the Aug. 21 final, Toin took an early lead in the bottom of the first inning on a wild pitch with the bases loaded. Following that, first baseman Mizuki Ishikawa hit a double to right-center field, scoring two more runners. Kanaashi Nogyo got on the board in the third inning with a sacrifice fly to right field. In the fourth inning, Toin left fielder Jinto Miyazaki responded with a three-run homer over the left-field fence. In the fifth inning, Toin tacked on six more runs, including a massive two-run homer by shortstop Akira Neo over the center-field fence. Kanaashi Nogyo's ace pitcher Kosei Yoshida, who had pitched in all five games until the semifinal, did not have his usual dominating stuff. He was pulled from the game after the fifth inning. Toin also won both the spring and summer championships in 2012. The victory also marked its first summer championship since 2014 and the fifth in school history. Including the spring championship, Toin now has won eight championships. Kanaashi Nogyo was attempting to win the summer championship for the first time in 103 years as a school representing Akita Prefecture. In the first summer championship held in 1915, a different school from the prefecture also advanced to the final. At that time, however, it also lost to a school from Kyoto Prefecture. In the latest summer championship, the number of spectators totaled 1.015 million over 16 days, exceeding 1 million for the first time.